WHY CHOOSE OUR ORGANIC CASTOR OIL? At Namskara, we believe in all-natural beauty solutions that deliver dramatic results! 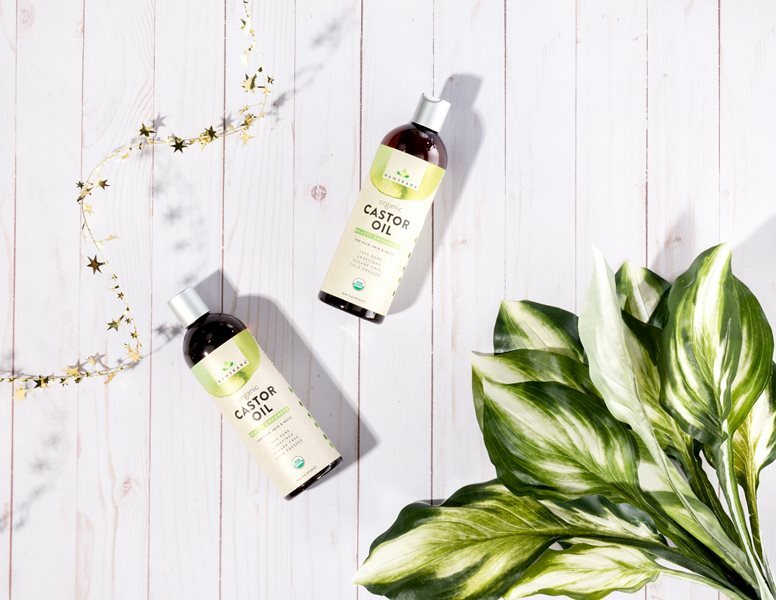 Extracted from non-GMO castor seeds, our USDA Certified Organic Castor Oil is cold-pressed from 100% pure, all-natural castor bean plant (also known as palma christi). Used by A-List celebrities, models and reality-show stars, unrefined castor oil is the best-kept secret to luscious lashes, brows that wow, and shiny, voluminous hair! Our extra-virgin castor oil treatment can also be used as a moisturizer to boost anti-aging benefits for the skin, strengthen nails and cuticles and diminish the appearance of stretch marks! 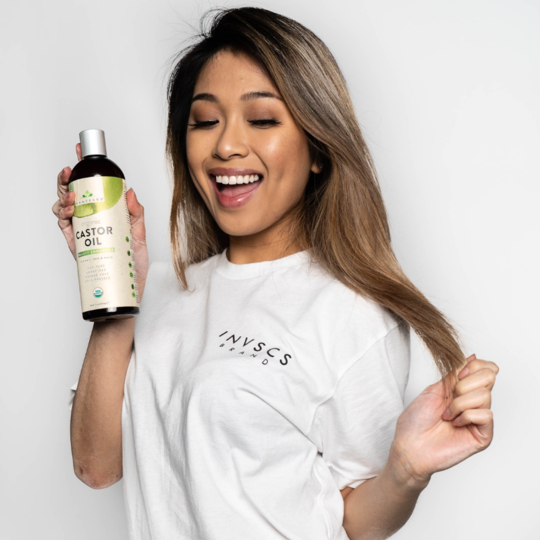 USDA CERTIFIED ORGANIC: Our Organic Castor Oil comes with a USDA Certification to guarantee the highest standards of purity, potency and quality. 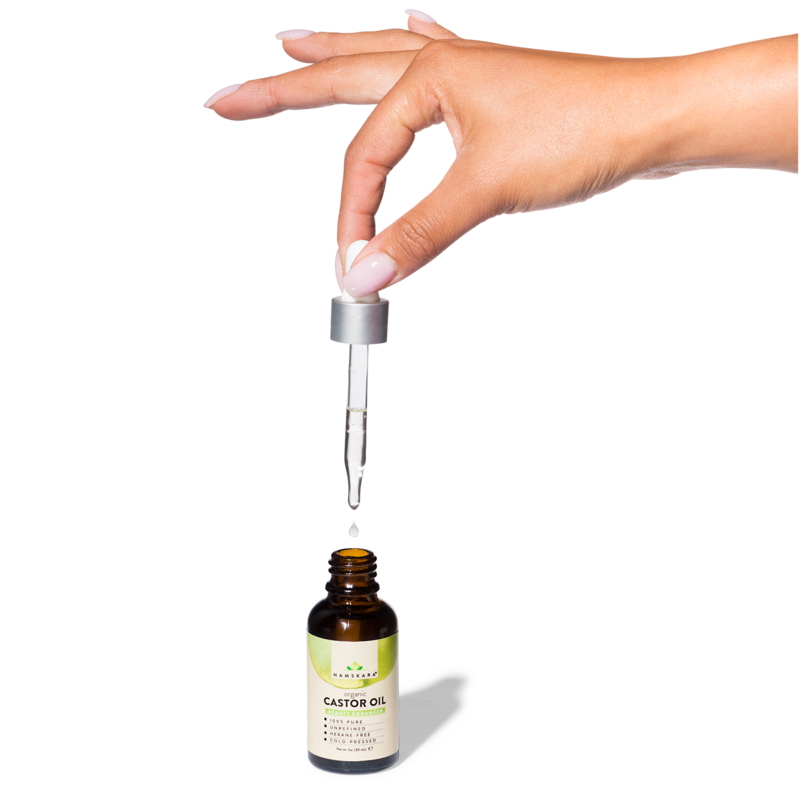 To ensure best results, it is also vegan, free of hexane (castor oil hexane free) and artificial ingredients, cruelty-free, cGMP Certified and FDA Registered. BOOSTS HAIR GROWTH: Naturally contains a very high concentration of hair growth vitamins and proteins (castor oil for hair growth) to prevent hair loss and promote long and luscious locks! STRENGTHENS AND LENGTHENS EYELASHES: Rich in Vitamin E and essential minerals, our Castor Oil for eyelashes can be used as a natural lash growth serum to help you achieve longer, thicker lashes! Comes with 2 applicator brushes for easy application! BROWS THAT WOW: Want to ditch the brow pencil? Our 100% pure castor oil will also help thicken eyebrows naturally! NOURISHES THE SKIN: Naturally rich in Omega Fatty Acids, it can be used as a Castor Oil Moisturizer for instant hydration and anti-aging benefits (castor oil for skin)! CONDITIONS CUTICLES AND DIMINISHES/CONCEALS STRETCH MARKS: This miracle beauty potion can also be used as a conditioner for cuticles, and can be used to diminish and conceal stretch marks! Add to cart to achieve these benefits - risk-free! If you are not satisfied, we will issue you a refund - no questions asked! Apply 2-3 drops of oil into fingers and gently massage into clean hair, eyebrows, eyelashes, scalp, or skin. May also be applied on dry cuticles and brittle nails as a conditioning treatment. Use daily for best results. MORE OIL, MORE DIY FUN! Castor oil is full of ricinoleic acid, a fatty acid found in castor oil with impressive anti-bacterial and anti-inflammatory properties which make it the perfect addition to your beauty regimen for maintaining a healthy scalp and hair! Apply as a hair mask to help stimulate hair follicles for longer, stronger hair and help prevent breakage. Castor Oil has been a best-kept beauty secret for centuries and is often referred to as "liquid gold" for this reason! Our hexane-free and USDA Certified Organic Castor Oil is cold-pressed from 100% pure, non-GMO castor beans. This versatile oil can be used as a natural skin moisturizer, to strengthen nails and cuticles, promote lash and hair growth, achieve brows that wow, and so much more!